Join us for Physical Audit, a project by Cassandra Thornton for the Flux Factory exhibition, Public Trust. Physical Audit begins with a casual meeting outside of a bank, where 8 dancers wash their hands. 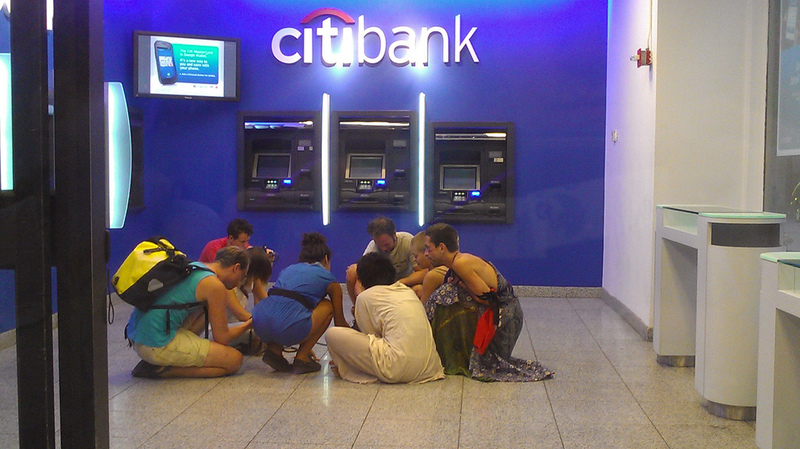 They enter the bank together, touching everything, and request a meeting to open a ‘collective’ savings account. Everything that happens while they are in the bank is an opportunity for the performers to touch as much as possible: they stretch and touch as much as they can, and accumulate dirt on their hands. At the conclusion of the performance, dancers rub the dirt from their hands onto paper. They have a difficult, memorable, irrational experience in this disembodied space. The action of touching is that of physical activation and citizen observation, but is neither aggressive nor intrusive– at best it will extend what seems possible within a financial institution. 1. Get Tickets: Please fill in a deposit slip with this account number: 4821576703. You can download the deposit slip here and print it or accept one from an usher at the theater (bank). 2. Come to TD BANK at the corner of Broadway & 50th Street in Manhattan on Saturday September 8 at noon. 3. Get in line to see a teller. Be a good audience member—everything that happens in the bank is a part of the performance. Remain quiet, observant, and respectful. As long as you are in line to have a transaction, your presence in the bank will be welcomed. 4. Make a deposit of any size into the account on the deposit slip. When you arrive at the teller, politely hand in your deposit slip with a small donation to support the performance. Feel free to engage with the teller, informing them of the performance that is taking place. 5. Get back in line. The performance will last between 45 minutes and 1 hour. Please feel free to make several deposits (any size, 1 penny and up!) so that you can remain in line for the duration of the event. In this dance, the broken connection between financial environment and being a human, (being a human includes non-utilitarian movement, difficult feelings, and shared experience) are examined– pushing what is possible while in a bank. The performance will be barely visible at moments, as we are watching dancers attempt to break the social and physical limitations associated with the bank—breaking themselves of normative behaviors that are boring and generic. Please be patient and observant while in line so you don’t miss any important moments of difficult touching! Visit the Physical Audit tumblr here.